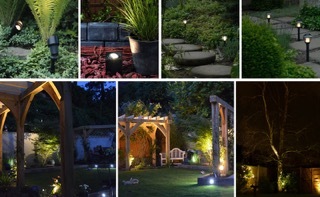 Extend the use of your garden with low voltage plug & play garden lighting. So what is low voltage plug & play garden lighting? Quite simply it’s a 12V system that consists of a transformer, a mains cable and garden lights. The transformer simply plugs into a normal plug socket. The mains cable which runs around your garden plugs into the transformer and the lights then simply plug into equally spaced plugs that are in the mains cable. Being low voltage the system is safe for anyone to install and with it also being plug and play means it’s incredibly easy as well. We all work hard creating beautiful outdoor spaces so why not extend their use by lighting them? It’s unfortunate that most of us spend the majority of daylight hours earning a living during the week, by beautifully lighting your garden you create the opportunity of relaxing outdoors on warmer evenings or simply enjoying it from the warmth of your home when the weather turns colder. Your garden can be transformed at night as lighting can be used to add depth, contrast and shadow. Have fun with it, plug and play lighting means you can constantly adapt your lighting to suit the seasons as your garden grows and matures. Watering your garden obviously also becomes an activity that is made much easier in the evening when your plants are lit. Another bonus is if you live in an area where foxes are a problem, lighting your garden not only discourages them from using your garden as a lavatory but also allows you to check that it is safe for pets to use. There are over a hundred different low voltage garden lights to choose from in the Techmar low voltage garden lighting range. There are also a number of cabling options to allow you to position your lights exactly where you want them. Nigel and the team at garden light shop have worked hard to become the UK’s leading supplier of plug and play garden lighting. Unlike other companies they only sell one garden lighting system which simply means everything on their website works with everything else. Their customer service is second to none happily helping anyone before they buy, helping with installation queries as well as helping customers sometimes years after their initial purchase. They will even create you a garden cabling design for free! While many have tried to copy their success, Garden Light Shop’s knowledge and customer service still separates them as being the place to go for garden lighting.